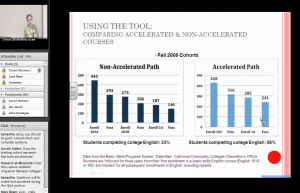 The Cohort Tracking Tool gives all 113 California community colleges immediate, easy access to data on student progress through their English, reading, ESL, and math pipelines. Envisioned and sponsored by 3CSN, this online tool has been expertly developed by the Research and Planning Group in collaboration with the CCCCO. Across the state, the lower down a student starts in our basic skills sequences, the lower their rates of completing college level gatekeeper courses in English and Math. 3CSN is committed to doing something about this: We support faculty to redesign their sequences to increase student completion. It gives all 113 California community colleges immediate, easy access to data on student progress through their English, reading, ESL, and math pipelines. Envisioned and sponsored by 3CSN, this online tool has been expertly developed by the Research and Planning Group in collaboration with the CCCCO.